Runesamurai wrote: There was a simple solution if you wanted to keep Gort as a sword user and Luke as an axe user. You actually could've just edited the bookshelf to say "Sword Techniques" and "Hunt for the Sword of Legend" instead of "Hand Axe Techniques" and "Hunt for the Axe of Legend." As far as everything else, perhaps. It is something I can look into in the future. The biggest issue I'm running into is the corruption when adding new weapon sprites. It's something I'll have to think about. It's not currently on my agenda at the moment, but we'll see. Ah I see. I did not know that. Erikin84 wrote: As far as everything else, perhaps. It is something I can look into in the future. The biggest issue I'm running into is the corruption when adding new weapon sprites. It's something I'll have to think about. It's not currently on my agenda at the moment, but we'll see. EDIT: I just tried to import the Imperial Mace into my game and then THIS happened. I see it’s a older version of the SFGU, and when the playable Kane patch was supported... how did you import the mace? Erikin84 wrote: I see it’s a older version of the SFGU, and when the playable Kane patch was supported... how did you import the mace? Yes. I downloaded it before you took it down. I simply went to weapons and clicked on where it said File and then clicked on Import and chose from where I saved the image of the weapon you provided on sfmods.com. EDIT: I'm definitely doing something completely wrong here. DOUBLE EDIT: I can't seem to import and export images correctly for some reason. I must be using the wrong file type or something. TRIPLE EDIT: I do hope something can be done about the The Knightly Saber sharing the same sprite as the Oath Keeper eventually. I feel it takes away from the uniqueness of Elliott's weapon. QUADRUPLE EDIT: You removed the Kindan No Hako...The only item among that group worth keeping...Why would you do this? The group I'm referring to is the list of items people call the "useless" items. The Kenji, Teppou, Kaku-chan, and Youji. Quick update, with Rubix back and possibly extending capabilities of the SF1 editor. Most of the issues with limits will be alleviated. I will update this mod in due time when the editor is updated. This mod makes SF1 look incredible, congratulations, I'm definitely combining this with the Brothers Mod for my next playthrough. I hope you eventually make something similar for SF2, too! Red_Shine wrote: This mod makes SF1 look incredible, congratulations, I'm definitely combining this with the Brothers Mod for my next playthrough. I hope you eventually make something similar for SF2, too! I second this. SF2 could really use a makeover as well. Maybe not as much as this game but some things in it certainly could. Like the Dark Sword and Levanter etc. It always annoyed me how the Dark Sword looks when wielded by Lemon or someone on the force. It really didn't make any sense. It’s something I can consider, however I haven’t used caravan or much of any other editor for SF2, any suggestions? Caravan is quirky, but if you combine it with SF2 Editor, it should give you a similar functionality to that of the SF1 Editor (SF2ed is mostly for editing data like growth curves and the like). If memory serves, Caravan can't edit sprites directly, so you'd have to export, work on them on an image editing program and then import, so it's an extra hoop. 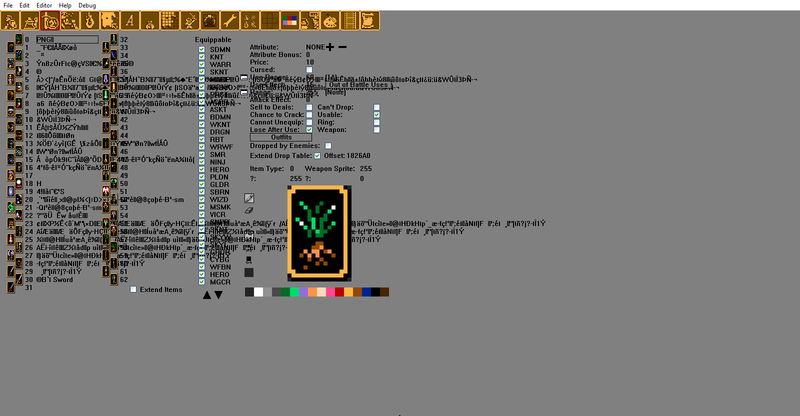 You probably know this, but you need an image editing program that supports indexed palettes, or things won't load properly (something like GIMP). If you'd like to laugh, I should still have my attempts at editing Bowie somewhere on my hard disk, haha. I primarily use paint to do my editing. Since there isn’t a history state in the editor you can easily go back if you make a mistake. If that's the case I suggest Paint.Net as an upgrade. It is free and adds more resources to the program like layers. Red_Shine wrote: If that's the case I suggest Paint.Net as an upgrade. It is free and adds more resources to the program like layers. This is a GIMP plugin that can work with several video game image formats. Perhaps it will be helpful too, along with Paint.NET. I miss this overhaul so bad. Runesamurai wrote: I miss this overhaul so bad. I'm truly going to miss Promoted Adam's sprite. I have to be honest. But that's good.